There are several ways to add additional drivers to ESXi. This can sometimes be necessary when implementing a new type of servers. So if you have a device that isn’t supported by the default installation of ESXi a driver needs to be added after the installation. This post will describe how to add an additional drivers to ESXi with update manager. It can also be done via the vCLI which is described by the guys at VMGuru.nl here. The additional drivers that are available to ESXi can be downloaded from the vSphere download page under the tab Drivers & Tools. All downloads will be delivered in ISO format. The ISO includes a zip file that contains the (offline-bundle) additional driver. 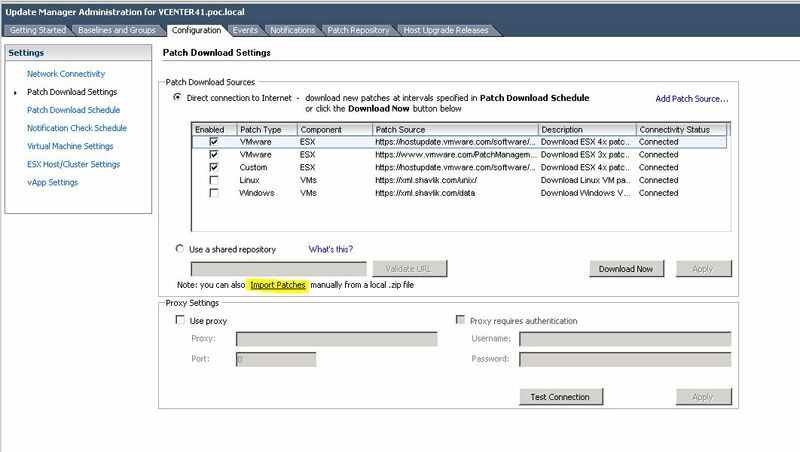 The additional driver will be available in zip-file which can be imported under Configuration -> Patch Download Settings in VMware Update Manager. There is a note (see picture in yellow) with a link to “Import Patches”. This will start a proces of importing the additional update into Update Manager. After this the update will be available in your repository. After which you can create a baseline and patch your ESXi hosts.